Often, families and friends come together to clean out houses after the death of a loved one, sometimes traveling from out of town. To make the most of your time and volunteers, we advise planning carefully to keep this big house clean out project on track. However, no matter how much thought, planning and work goes into the issues at hand, the family and loved ones cannot address the emotional toll of dealing with cleaning out a parent or loved one’s house and personal effects, or the challenges of dividing up assets among family members. This begins with some basic volumetric equations. 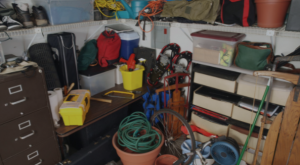 How much ‘stuff’ has been accumulated in the property over the years, including all the furniture, everything in cupboards and drawers, and all of the boxes in the sheds and garage? Melbourne Forensic Cleaning technicians have found that may take approximately 1 to 1.5 man hours per cubic meter of material to completely clean out a house. The more sorting and cleaning that’s required, the longer it’s going to take. Too often, estate managers seriously underestimate the expanse of work that goes into a house clean out. When that happens, the project can drag on for months or even years. No matter how sentimental something may seem to you, at the end of the day the majority of the items won’t have monetary value. That’s why even the most pristine houses yield truckloads of trash that families need to deal with. Not every family wants a skip bin parked out front through the duration of the clean-out but you will likely need one.